No matter where you live, gaming costs, and it costs a lot. Where I live, in Poland, the average salary is approximately 2500 zlotys a month, which works out to about $902. Let's reflect this payment against a popular product on the market, an Xbox 360. The console itself costs roughly 829 zlotys, but you'll need an additional 220 for a game to play on it. The massive cost of gaming throughout the Polish market has driven people to pirate their entertainment; when you are poor you have to make hard decisions, but for many people, whether or not to pay for such an expensive luxury when they don't have to isn't that difficult a choice. My dad made that decision for me. We had an Atari 800XE, but it was very difficult to use. Making the cassette recorder work and copying the games was a chore, not to mention inputting commands in BASIC every single time you wanted to play Keystone Kapers or Fred. And so, a fake Nintendo Entertainment System appeared in my household: The Pegasus. The Pegasus gave me one of the first, and most important, lessons on cheap gaming: If it's a fake, it's probably cheap as well. Buying cartridges from Russians at various flea markets was a good idea, though. I've never played more Contra versions and hacks in my life. Cartridges with 9999 in 1 Contra games blew my mind and I went through many, many fake NES controllers. Even if they were knock-offs, I still found plenty of fun in those flea markets, but if you live in an area with shops that accept used games, you might have better luck at those. On the other hand, going to shops might not always be a good idea if you're short on cash. 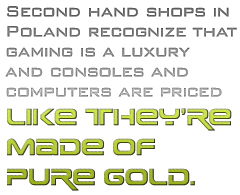 Even second hand shops in Poland recognize that gaming is a luxury and consoles and computers are priced like they're made of pure gold. Piracy is easily the cheapest and easiest option when it comes to acquiring games, but comes with a few downsides, including being caught by the police or spending more time trying to get the game to run than actually playing it. Of course, game publishers would prefer that such a person stop pirating games, but why would he if his choices are spend a month's salary on a game or get it for the cost of an internet connection? In an area like Poland, it's understandable why people turn to piracy as their source for gaming, but there are alternatives. Free MMOs deliver a great amount of content without the required subscription fees but often contain shops in which real currency can be used to kit your character out with extra features. Free MMOs often recycle gameplay elements from other popular titles but instead include more extensive ranking and leveling features to keep users hooked. If you lack money and don't want to pay that subscription for World of Warcraft, you can always convert to the many free clones out there. If you're not an MMOG person, you can find plenty of mods for games you already own on MODDB.com, or perhaps some good indie games.